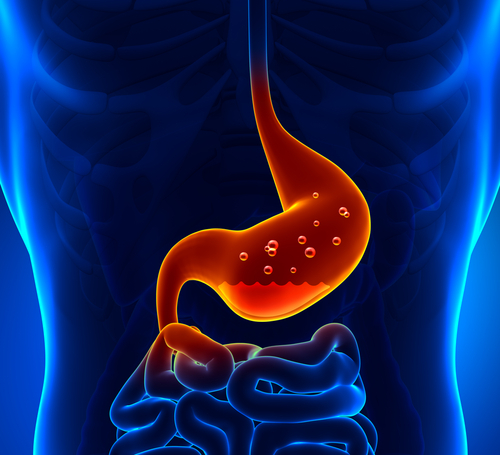 Gastritis is often termed to a condition which involves inflammation of the mucosa of stomach. Mucosa is protective lining inside of the stomach which prevents it from the destructive effects of acidic contents. When due to alcohol consumption or by excessive use of Nonsteroidal anti inflammatory drugs (NSAIDs), the mucosal surface is damaged, small ulcers are formed there. It often leads to bleeding and person feels intense pain in stomach. Gastritis can be acute if the symptoms develop suddenly or it can be chronic when prolong inflammation is going on inside the stomach. Chronic gastritis can also lead to the carcinoma of stomach. Alcohol consumption : Due to excessive alcohol consumption, mucosal lining is damaged which leads to formation of ulcers and bleeding tendency in the stomach. Use of NSAIDs : These drugs are notorious to destroy the protective mucosal lining and hence their chronic use ultimately cause the gastritis. Helicobacter pylori infection : This bacteria plays a major role in causing gastritis. It is usually transmitted by contaminated food and water. Bile reflux : Sometimes, the bile flows back into the stomach from the bile tract and hence causes gastritis. Stress : Any stressful condition such as burns, illness or surgery usually become a major cause of gastritis. Trauma : Any trauma to the body leads to the development of ulcers formation in stomach. Autoimmune disorders : In certain autoimmune disorders, antibodies are formed which fight against the normal cells of stomach and destroy them. Digestive disorders : Certain inflammatory diseases such as Crohn’s disease cause the formation of ulcers and chronic gastritis to develop. Infections : Certain viral and fungal infections are also some causes of gastritis. Certain factors increase the risk of developing gastritis. Age : In old age, the lining of stomach becomes thin and person become vulnerable to gastritis. Excessive use of pain relievers : NSAIDs, for example aspirin and ibuprofen can increase the risk of gastritis in overdoses. Excessive alcohol consumption : People who take more alcohol are at more risk. Bacterial infection : Infection of Helicobacter pylori greatly increases the risk of developing gastritis. Autoimmune disorders : In autoimmune disorders, stomach cells are vulnerable to damage and hence gastritis occurs. Coffee : Consumption of coffee destroys the mucosal lining of stomach and increases the risk of gastritis. Blood tests : Complete blood count reveals if anemia is present and ESR indicates the presence of inflammation. Urea breath test : This test is used to detect the Helicobacter pylori infection. Abdominal examination : Physician performs the abdominal examination to see any tenderness or pain. Endoscopy : A tube is passed from mouth to stomach to visualize the inside of the stomach. Biopsy : A sample of the tissue of stomach reveals the infection and inflammation going on. X ray of upper digestive tract : After swallowing a barium meal, an X ray is taken of the abdomen in which doctor checks signs of ulcers and erosion. Stool examination : It indicates the infection if present and inflammatory cells in the digestive tract. Avoid taking excessive NSAIDs and reduction in alcohol consumptions greatly prevent the gastritis. Washing hands, eating properly cooked meals and adequate hygiene are also good preventive measures.